The Prep Wife: Winner, winner! It all ended before it even started. I was about eight or nine years old and excited to surprise my family with dinner. I had never cooked before but, for some reason, I suddenly had the urge. Not knowing a thing about cooking, I shuffled through the cupboards and through the fridge touching and smelling whatever I could get my hands on. Everything looked foreign to me. I asked myself how these random things turned into food. Balancing myself on the tip of my toes, I finally ended up reaching for something I could recognize. A little box with the ever-so-familiar Corn Flakes rooster on it. Was I going to "cook" cereal for dinner? No. 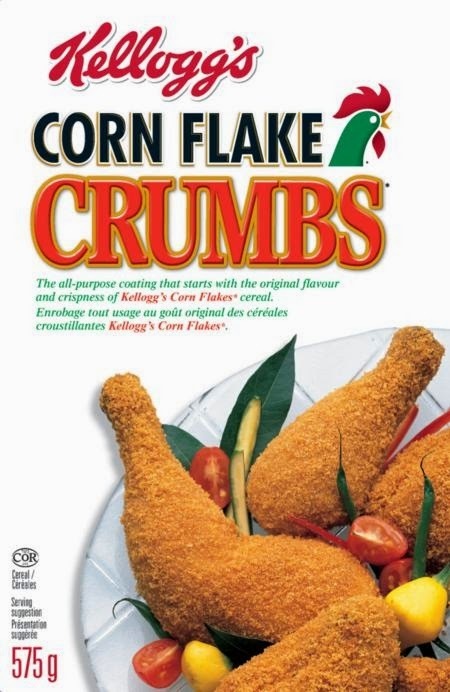 I was holding a box of Corn Flakes Crumbs and, to my delight, there was a recipe on the back of the box. Perfect! We had a winner! Winner, Winner, chicken dinner! With every second that passed, I was getting more and more excited at the thought of treating my family to crispy, golden chicken. As I started reading the back of the box, my excitement and delight grew exponentially. I was thrilled at how easy the recipe was. Everything looked simple and straight forward. Season the chicken, coat the chicken in cereal crumbs and put it in the oven. Having devoured every single word on the box, it was time to cook! I put on an apron (because that's what I had seen grown-ups do when they cooked) and opened the box. As I emptied its contents, my delight suddenly turned into despair...Where was the chicken? The chicken does not come in the box? ... (may I remind you I was eight or nine years old and completely clueless in the kitchen). Like I said, it all ended before it even started. I hung the apron back at its place, put the deceiving-chicken-box where I had found it, enjoyed the afternoon likely watching cartoons and waited for somebody else to prepare dinner. Here's a recipe for deliciously crispy oven-baked chicken. 1- Preheat oven to 425F. Line a baking sheet with aluminum foil and spray the foil with cooking spray. 2- Put flour in a shallow dish, add salt and 1/4 tsp pepper. 3- Put buttermilk in a big enough bowl that can fit the chicken pieces, add Dijon and cayenne pepper. 4- Place the cornflakes crumbs in another shallow dish. 5- Dredge each piece of chicken in the flour making sure it is well coated. Then dip each piece of chicken in the buttermilk, and then roll it in the crumbs. 6- Place the coated chicken pieces on the baking sheet and bake for 15 minutes on 425F then turn the oven temperature down to 375F and cook for another 30-40 minutes. The juices should run clear when the meat is pierced.